I just fell in love with Christmas Dreams by Dona Gelsinger and while I know I'll never finish it by this Christmas, I have hopes for 2015 but we'll see how it goes. Then I found this group and started looking over the work of others here. Amazing! I only hope mine will turn out half as well. Any tips or tricks would be greatly appreciated. I've typically done Dimensions Gold Collection kits in the past, I love the fullness of the designs, but starting an HAED is a whole different challenge! 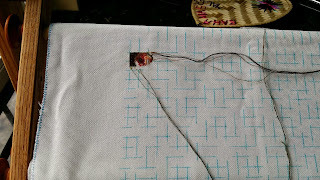 I've never worked on linen before, generally Aida 14 & 18 count, so the 25 count evenweave is definitely different for me. I'd also always just held my work in my hand, but decided for this a roll bar frame would probably be a good investment. The frame I got came with 20" dowels and the fabric is close to twice that in width so I had to do a little folding/rolling on the right side to fit it in the frame. That of course led to some looseness on the area where I was going to be stitching, to resolve this I took a linen dishcloth (I'd bought a bundle of 12 a while back and have only used a couple so had plenty of unused ones in a drawer), cut one in half and rolled it with the bottom to help take up the slack. I'm not sure I'd want to order longer dowels as I typically stitch on the couch while watching TV, anyone have any better suggestions? I'm doing 1 over 1 on 25ct. Thanks for letting me share my journey with you! Your project is wonderful and I am sure you will enjoy the process.